The US has imposed sanctions on the new vice-president of Venezuela, accusing him of involvement in international drug trafficking. 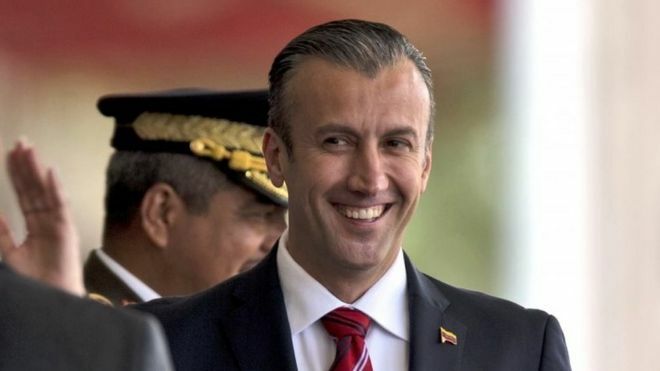 The order adds Tareck El Aissami to the US narcotics “kingpin” sanctions list “for playing a significant role in international narcotics trafficking”. Mr El Aissami, who was appointed last month by President Nicolas Maduro, dismissed the allegations as an “imperialist aggression”. He said that “the truth is invincible”. In a series of tweets [in Spanish] he said that he saw “this miserable and infamous aggression as a recognition of my condition as an anti-imperialist revolutionary”. Mr El Aissami is seen as a powerful figure within the governing PSUV party and has been entrusted by Mr Maduro with key powers normally held by the president, such as determining ministerial budgets and expropriating private companies. The US Treasury alleges that Mr El Aissami facilitated huge shipments of narcotics from Venezuela by air and sea. It also says he was in the pay of convicted Venezuelan drug lord Walid Makled for the protection of drug shipments. The sanctions freeze his assets in the US and bar him from entering the country. John E Smith, acting director of the US Treasury’s Office of Foreign Assets Control, said the sanctions were the culmination of an investigation “to target significant narcotics traffickers in Venezuela and demonstrates that power and influence do not protect those who engage in these illicit activities”. “This case highlights our continued focus on narcotics traffickers and those who help launder their illicit proceeds through the United States,” he said. Sanctions were also slapped on wealthy Venezuelan businessman Samark Lopez, described as Mr El Aissami’s “primary frontman”. The Treasury listed 13 companies in the British Virgin Islands, Panama, the UK, the US, and Venezuela linked to Mr Lopez. Mr Lopez released a statement saying he had not engaged in drug trafficking. He also said that there was no factual evidence or legal justification for his name being placed on the sanctions list other than that he and Mr El Aissami were personal acquaintances.